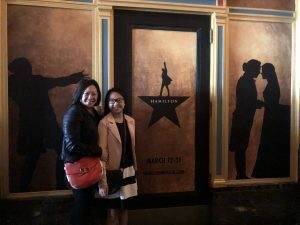 Yesterday my oldest and I went to see HAMILTON…and OH MY I have to say…it is one of MY FAVORITE!!! The singing was just amazing!!! 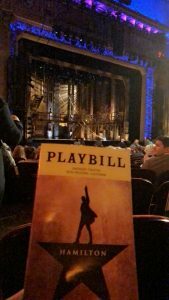 If you ever have a chance to go…you should DEFINITELY GO!!! I only have one side note…I don’t think its appropriate for children under the age of 10 to go…because I don’t think they will understand the play as well. Plus, they do have some cursing in the musical. 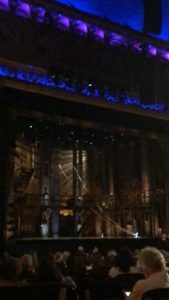 The set is very plan..they didn’t have much of a set change or anything fancy in the set. The singing was amazing and the dancing was superb!!! We had very good seating. We purchase our tickets about 1,5 months ago. Since the play was so popular…we had to register for a CODE in order to buy our tickets…and MAX was only 4 ticket per code. The process to buy these tickets were so different from other. But I am so happy I got a chance to see this play!!! The play was about 2hrs 45 minutes. But it didn’t seem long at all. GO if they ever come to your HOMETOWN!! !